We certify individuals who have been selected by their organization to be responsible for the training of their cleaning workers. 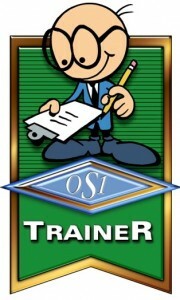 An (OS1) Trainer is required to take part in an annual, in-service (OS1) Train the Trainer program that is designed to keep them up to date on the most current cleaning procedures, chemicals and cleaning tools, training techniques, and new information in the (OS1) Program. It is required that they attend this class within a 12 month period, in order to maintain their (OS1) Trainer Certificate Holder (OTCH) status. This group includes individuals from all different types of organizations around the United States. The Janitor University – Executive Management class is a prerequisite for this class. (OS1) is based on the Team Cleaning concept. Certification of the cleaning workers is done within an organization by the (OS1) Trainer. Cleaning workers first complete a Boot Camp class or initial (OS1) training. This is followed by Basic Training, (90 days of working in the field). Upon completion of both Boot Camp and Basic Training, cleaning workers can then begin to work on their individual designations as a Light Specialist, Vacuum Specialist, Restroom Specialist or Utility Specialist. Each Specialist function requires the cleaning worker to pass an examination, to prove that they are proficient in each team specialist function.